Aromatic flower bud of a clove tree; yields a spice. 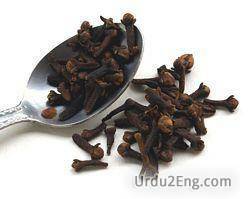 If you have cough use clove tea for relief. Moderate sized very symmetrical red-flowered evergreen widely cultivated in the tropics for its flower buds which are source of cloves. 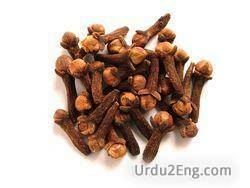 Clove tree is known as another name Eugenia Caryophyllatum. One of the small bulblets that can be split off of the axis of a larger garlic bulb.